Soft top only. No hard top was made for these years. The Viper, at its introduction to the public, was intended to be two things to the corporation. The public version was that Chrysler needed a halo car to show they were still the best at building a low cost vehicle of any type and beating the old Shelby Cobra 0-100-0 times was a showman's way of achieving just that. Privately (and more importantly), within the corporation, the Viper was a production technique test bed- to see if the corporation really could develop new methods of manufacture and assembly to lower the cost of a vehicle. It was originally intended to be killed off and a totally different vehicle replace it in the 1997 model year. If you take a look under the skin of a 1st generation Viper, it was a crude and rude "kit car," similar to what home builders had been building for years in Cobra replicas. Chrysler (actually JTE engineers working on their own time) translated this into a vehicle and production line that, in one fell swoop, became the most sought after assignment in the corporation up to that point. Team Viper's primary goal was a vehicle that concentrated on performance above all else. Their benchmark: to go from 0 to 100 back to 0 in under 15 seconds. The first result was a show car, which appeared on January 4, 1989 at the North American International Auto Show in Detroit to test public reaction; orders began to flow before the show ended, and the "go" was given. Chrysler decided to use the Viper RT/10 to test its new platform team concept, taken from Honda's process. An independent cross-functional team was created, making its own rules and creating its own supplier base. The team leader sifted through scores of volunteers to find appropriate people. Team Viper began three years of intensive, often around-the-clock operations that stretched from Italy, where the aluminum engine block was perfected -- to the race tracks at Nelson Ledges and Road Atlanta, where they fine-tuned the chassis and powertrain. Team members worked closely with major automotive suppliers to develop unique components for the Viper RT/10 which would withstand the tremendous stresses associated with high-performance driving. For Chrysler, the Viper itself was considerably less important than the lessons learned in the platform teams, which would soon create in rapid succession the LH (Intrepid), PL (Neon), Clouds (Stratus), new minivans, new Ram, Prowler, and more. Chassis prototypes, called "mules" in the automotive industry, were developed to study vehicle dynamics. Within a year of Viper's auto show appearance, a V-8-powered mule was being tested. A few months later, a stable-mate powered by a cast iron V-10 (presumably from the Ram) joined the test fleet. Finally, in May 1990, Chrysler announced that the Viper would be made with the aluminum V-10; and in May it performed as the official pace car of the Indianapolis 500. Finally, in December of 1991, the first red Viper RT/10 production vehicles rolled off the New Mack Avenue assembly line -- exactly three years after the concept car's 1989 auto show triumph. A second color, black, appeared in 1993, followed in 1994 by yellow and emerald green. The RT/10 was joined by the Viper GTS in 1996, bringing some refinement to the design, so that it would be one of the world's premier Grand Touring cars rather than a raw racer. The GTS was seen as catering to a broader customer base than the RT/10. While the GTS and the RT/10 look much alike, more than 90 percent of the Coupe was new. Every major part was subjected to scrutiny with telling effect: the GTS with air conditioning weighed nearly 100 pounds less than the 1994 RT/10 without air. Weight reduction changes on both platforms reduced weight by 200 pounds; these included an all-aluminum suspension system and re-engineered frame. For GTS, weight reduction was focused in the engine and cooling system, where over 80 pounds were removed. Viper's 8.0-liter engine is the largest and most powerful available today in an American production sports car. Viper GTS Coupe and RT/10 Roadster share the same 450 horsepower (460 in GT2 and ACR models) engine, suspension, brake system and adjustable pedal set. Air intake is through a cast aluminum manifold with formed tubes, including an integral fuel rail cored in the castings. The dual throttle bodies and bottom-feed high-impedence fuel injectors control fuel flow and mixture. Fuel is fed to the injectors by a sequential multipoint injection system. The engine's forged aluminum pistons are set in cast iron liners. The aluminum cylinder head features a conventional two valves per cylinder with higher-revving dual valve springs. While a natural extension of the classic American V-8 (the small-block LA series, to be exact), a number of the V-10's unusual design features were derived from Formula One engines. Among these features are a closed tappet gallery for better intake manifold seating, and a sophisticated internal water flow system which traces its route outside the engine block, inside the cylinder head, around each cylinder and inside each combustion chamber for increased engine cooling. Spent combustion gasses travel through a stainless steel tubular exhaust manifold, then pass through unique sill-mounted catalytic converters and exit at the center rear. The six-speed manual transmission was designed to harness Viper's substantial power and match its high-performance expectations. It boasts an electronic reverse lockout feature and first-to-fourth skip-shift for fuel economy. In developing this engine, Team Viper set out to maintain the simple powertrain design of classic high-performance sports cars -- because simplicity leads to durability, reliability and serviceability. 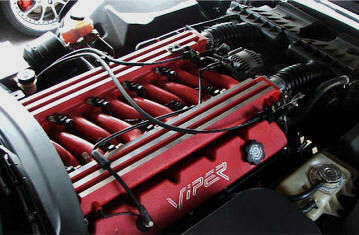 Viper's massive V-10 engine is mounted on what is believed to be the stiffest sports car chassis ever built. The engine is cradled by two massive rectangular-tube frame rails, which turn out at the front bulkhead and continue on down the sides. Positioned between the front bulkhead and the back of the cockpit is a central backbone of smaller rectangular tubes. This is attached at the back to a cage or box which encompasses the rear suspension, a 19-gallon fuel tank, a spare tire, the battery and the trunk. The fully independent front and rear suspensions feature unequal-length upper and lower "A" arms and coil-over springs made of lightweight, yet strong micro-grain alloy steel. High-performance gas-filled shocks minimize aeration. The power-assisted rack-and-pinion steering system features positive on-center feel and a fast 16.7:1 steering ratio for quick and responsive maneuvering. Lock to lock is accomplished in a mere 2.4 turns. Viper's turning circle is 40.5 feet and its maximum turning angle is 28 degrees. Viper's high performance brake system features four-piston front calipers with huge 13" x 1.26" vented rotors up front and 13" x.86 vented rotors at the rear. This system was specially designed to help meet the stated test-track goal of 0-100-0 mph in less than 15 seconds. Truly massive high performance Michelin Pilot Sport tires created for the Viper are instrumental in translating the car's abundant horsepower and torque to more linear terms. These directional tires, 275/35ZR18 front and 335/30ZR18 rear, are a major factor in Viper's 1g lateral acceleration capability. The tires are mounted on forged aluminum wheels with Viper logo centers (BBS forged aluminum wheels with chrome Viper Head center caps for the GT2 and ACR models). Finally, Viper's cooling system consists of a lightweight copper-core radiator and an electronically controlled dual-speed electric fan. A front-mounted engine air-to-oil cooler is also standard. Each Dodge Viper is hand-assembled at a special Detroit, Michigan facility on Conner Avenue by carefully chosen, skilled UAW workers with over 300 hours of training each. Each Viper is made up of approximately 50 component modules which are shipped to the Viper facility from locations throughout North America. Stamping, casting, painting and welding take place off-site. Composite body panels arrive already painted. Complete instrument panels are supplied with the gauges tested and set in place. Engines are assembled and tested at a Chrysler engine plant. The Conner Avenue Assembly Plant has adjacent work stations. Adjustments are made at each work station by individual craftspersons acting as their own inspectors, eliminating traditional repair stations and inspectors. Problems are immediately dealt with, even if they require a discussion with the on-site Team Viper engineer. All procedures are verified by assembly team members, with working team leaders coordinating efforts through craft managers. The Viper assembly process is as unique as the car itself, even extending to testing procedures. For example, as is the case with race cars, wheel alignment includes adjustment of "bump steer." A special machine is used to align all four wheels off their wheel hubs. In this way, the wheels are moved up and down in their suspension travel and alignment is set in three different positions. Every Viper is also "roll tested," which involves running the car at speed, in place, on special rollers right at the assembly center while the car is a "hot rolling chassis" minus all body panels. It is driven through all six speeds of its transmissions, up to 90 mph, in order to validate the proper functioning of all systems under actual driving conditions. The Viper was conceived as a futuristic take on the classic American muscle sports car. While there are some who insist that the iconic AC Cobra was a source of inspiration, the final version of the Viper was far too large and heavy to seriously claim any direct lineage with the compact and lightweight vehicle. Most saw claims to kinship with the Cobra as a marketing exercise, although Carroll Shelby was involved in the initial design of the Viper. Notably, the Viper took many design cues from the Shelby Cobra Daytona. 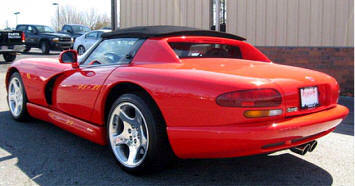 The Viper was initially conceived in late 1988 at Chrysler's Advanced Design Studios. The following February, Chrysler president Bob Lutz suggested to Tom Gale at Chrysler Design that the company should consider producing a modern Cobra, and a clay model was presented to Lutz a few months later. The car appeared as a concept at the North American International Auto Show in 1989. This concept vehicle was originally named Copperhead because of its low, wide appearance characteristic of reptiles. The name would later be changed to Viper. Public reaction was so enthusiastic, that chief engineer Roy Sjeoberg was directed to develop it as a standard production vehicle. Sjoberg selected 85 engineers to be "Team Viper", with development beginning in March 1989. The team asked the then-Chrysler subsidiary Lamborghini to cast some prototype aluminum blocks based on their V10 truck engine for sports car use in May. The production body was completed in the fall, with a chassis prototype running in December. Though a V8 was first used in the test mule, the V10, which the production car was meant to use, was ready in February 1990. Official approval from Chrysler chairman, Lee Iacocca, came in May 1990. One year later, Carroll Shelby piloted a pre-production car as the pace vehicle in the Indianapolis 500 race. In November 1991, the car was released to reviewers with first retail shipments beginning in January 1992. The first prototype was tested in December 1989. It debuted in 1991 with two pre-production models as the pace car for the Indianapolis 500 when Dodge was forced to substitute it in place of the Japanese-built Stealth due to complaints from the UAW, and went on sale in January 1992 as the soft roofed RT/10 Roadster. The centerpiece of the car was its engine. Originally designed for a truck platform and based on the Chrysler LA design, a division of the Chrysler Corporation revamped Dodge's cast-iron block V10 for the Viper by recasting the block and head in aluminum alloy. Some within Chrysler felt the pushrod two-valve design, while adequate for the truck application, was unsuitable for a performance car and suggested a more comprehensive redesign which would have included four valves per cylinder. Chrysler, however, was uncertain about the Viper's production costs and sales potential and so declined to provide the budget for the modification. The engine produced 400 hp (298 kW) at 4600 rpm and 465 ft�lbf (630 N�m) of torque at 3600 rpm, and thanks to the long-gearing allowed by the torquey engine, provided surprising fuel economy at a claimed 21 mpg US (11.2 L/100 km) if driven sedately. The body was a tubular steel frame with resin transfer molding (RTM) fiberglass panels. Much of the suspension, following the manufacturer's "engine first" mantra, was sourced from the Dodge Dakota pickup. Typical of American performance car design, it had a front-mounted engine driving the rear wheels; it was also very light in respect to modern Ferrari's with a curb weight of 3,280 lb (1,488 kg) and lacked many modern driver aids such as traction control or anti-lock brakes. Car and Driver magazine referred to this generation as "the world's biggest Fat Boy Harley", and likened driving it to "playing ping pong with a Louisville Slugger baseball bat." Despite this, in straight line performance, it completed a quarter mile in 12.6 seconds and had a maximum speed of over 180 mph (290 km/h). The car was also devoid of any real luxuries. Along with the absence of exterior door handles, the vehicle lacked windows and even a roof. Although a soft top cover was available, it was designed primarily for outdoor vehicle storage. In terms of interior space, the trunk was large enough for the rain cover and little else. Chrysler's purpose for the vehicle was clear in almost every aspect of its construction; from the unyielding bolstering of the seats to the side-exit exhaust that came with its own disclaimer against passenger injury. Performance came first, creature comforts last (if at all). The 1992 Viper began Dodge's legendary sports car fleet, and did so in fine fashion. With a 8.0-liter, 10 cylinder engine that pumping out 400 hp, the raw power of the 1992 Dodge Viper has done its namesake proud. Built for acceleration, the Viper is a must-drive for any speed junkie. The 6 speed manual transmission gives an experienced driver absolute control over the 400 hp. The 2 door, 2 seat 1992 Dodge Viper gets 15 city miles per gallon and 17 highway, which could go quick if you're driving it as fast as it wants to be driven. The fact that the 1992 Viper didn't come with AC out of the factory might be an incentive to keep the speed up, if the pure fun isn't enough of a reason. The interior of a convertible moving 80 miles an hour or faster isn't going to get too hot. Owners of the 1992 Dodge Viper love the acceleration and power of the car, though it's touchy to drive, and many suggest drivers not used to sports cars should take it easy in the Viper. They do complain about the lack of comforts like air conditioning and a backseat. But if you're looking for a fast, summer-fun car, then the 1992 Dodge Viper might be the car for you. 1993 heralded the continuation of a legend: the Dodge Viper. Not many changes were made from 1992, so the 1993 Dodge Viper still has an 8.0-liter, 10-cylinder engine that can churn out 400 hp, controlled by a 6-speed manual overdrive transmission. The only major change was the gas mileage: city dropped to 13 mpg, and highway was boosted from 17 mpg to a far more reasonable 21 mpg. The 1993 Dodge Viper was built for just one thing: to go fast and have fun. Unfortunately, only 1500 of the 1993 Vipers were made, so this year isn't common. 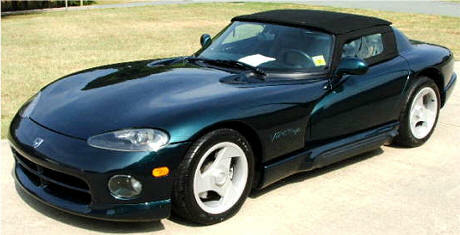 But if you can find a one, there are few cars out there that can match the 1993 Viper's acceleration, power or attitude. Owners of the 1993 Dodge Viper are crazy about the power the car is capable of and its ability to turn heads. They aren't particularly crazy about the lack of comforts like air conditioning, a backseat or trunk space, but the Viper isn�t about comfort. It's about speed, and to that end, Dodge succeeded admirably for the second year running. Owners of previous Vipers asked, and Dodge saw to it that they received. The 1994 Dodge Viper was the first year the Viper had air-conditioning installed as a factory option, a major advance for this powerful sports car. But don't worry. In adding this single, but wonderful, comfort, the 1994 didn't lose any of the power or acceleration that the Dodge Viper had become famous for. With an 8.0-liter 10-cylinder engine churning out 400 hp, the 1994 Dodge Viper is a speed machine. With its noticeable, low profile shape, the 2-door roadster convertible Dodge Viper turns most heads it passes. There is very little that is practical about the 1994 Dodge Viper, but it wasn't built with practicality in mind, just speed. With 14/22 mpg (city/highway), the 22-gallon tank will take you wherever you need to go quickly, if not necessarily fuel-efficiently. Who wants to drive a Viper in the city anyway? Owners of the 1994 Dodge Viper love the speed, acceleration and head-turning ability that the Viper has become so well known for. The lack of creature comforts is still a minor issue, as is the difficulty with putting on and removing the hard-top, but the Viper does what it was made to do: go very fast and make other people jealous. What do you get when you take an 8.0-liter, 10-cylinder engine that puts out 400 hp, drop it into one of the most recognizable and confident 2-door roadster convertible bodies in automotive history, and put a speed hungry driver behind the wheel? The 1995 Dodge Viper with you driving, that's what. Almost nothing was changed in the Viper from 1994 to 1995. Why mess with near perfection, right? Air-conditioning is the only real factory option available for the 1995 Dodge Viper still. But with 2 seats, the only people you have to keep comfortable are yourself and a passenger (if anyone you know gets that lucky), and you're probably going to be too busy enjoying the raw power at your fingertips through the wheel and the 6-speed manual transmissions to notice insignificant creature comforts or care about your passenger's comfort level. If they're not as impressed with your Viper's performance, who needs 'em anyway? There was a small but unfortunate drop in gas mileage in the 1995 Dodge Viper, down to 12/21 mpg (city/highway), but sacrifices sometimes need to be made for power. Owner opinion of the 1995 Dodge Viper is just as high as it has been in previous years. Consumer reviews of the 1995 Dodge Viper typically revolve around the speed and acceleration (claims of 0-60 of under 4 seconds have been made by more than one user). Viper owners are die-hard believers in this muscle car, and they seem to have good reason to be. Transition year. Introduce the next Generation GTS Hard top Coupe. Viper RT-10 Convertible last year as a Generation 1 although some consider this car a Viper Generation 2.